a) Household members should be encouraged to use salt fortified with iodine. b) High doses of Vitamin A to be used within six week of delivery. c) Iron supplements to be used during the last six months of pregnancy. a) Increase intake of food during pregnancy and lactation. b) Rationale for supplements or fortified food products for mothers. Certain nutrients in the breast milk can be affected by the maternal diet (Vitamin A thiamin riboflavin, vitamin B6, Vitamin B12, Iodine, Selenium). 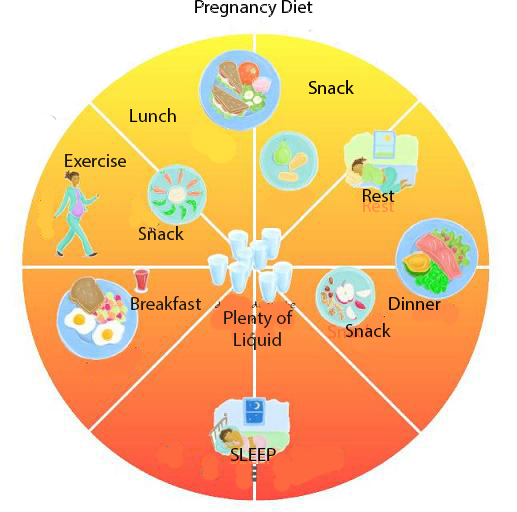 c) First choice is to improve the mother diet, but cost constraints limit options. d) Adequate micro nutrient intake during lactation can benefit both mother and infant. e) In order to maintain better Maternal health ,mother should increase the consumptions of fruits and vegetables, animal proteins products and fortified food especially during lactation and pregnancy. f) Consume daily supplements (Iron/folic acid -60 mgiron+40 mg folic acid or multiple vitamin supplements) during pregnancy and first three months postpartum as long as breast feeding . g) If anemic, consume a daily dose 120 mg iron and at least 400mg folic acid for three months. h) Consume high dose (200,000IU) of vitamin A immediately after delivery. a) If pregnant women is suffering from Malaria in endemic area. Anti malarial drugs for curative and prophylactic measures be made accessible for treatment of the symptoms and clinical infection. b) Promote use of insecticide treated materials. c) Pregnant women should take ant malarial drugs in the second and third trimester as a curative treatment regardless of the symptoms or take weekly ant malarial prophylaxis starting at first antenatal visit. e) Use insecticide material such as bed nets. a) Counsel the women on the preventive measures (sanitation and foot-wear). b) Prescribe and make accessible antihelmenthics medication after first trimester of pregnancy. c) Mother should wear shoes and dispose feces carefully to prevent infection. d) Take single dose of albendazole (400mg) or single dose of mebendazole (500mg) in the second and third trimester of pregnancy as treatment of hookworm. If hookworms are highly endemic (>50 percent prevalence) take additional dose in the third trimester of pregnancy.